Got family coming up for Christmas? Not sure what to do while they're in town? Check out our top picks to keep everyone entertained! 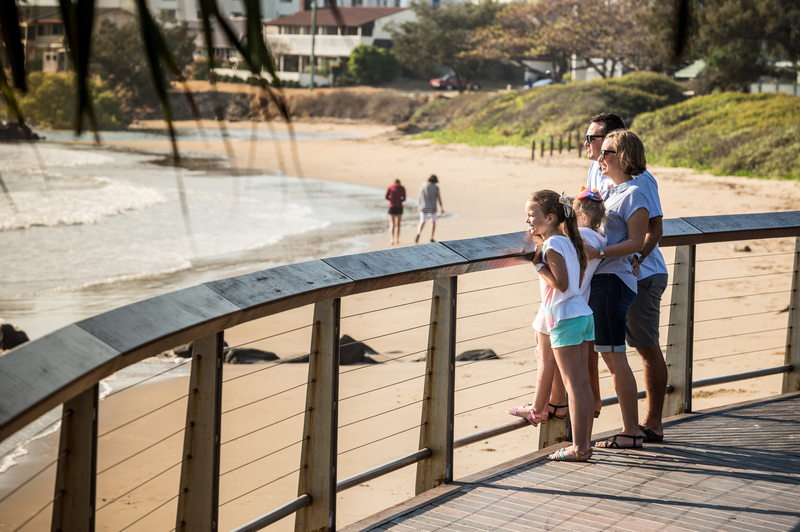 Grab Mum, Dad, Nan, Pop, and the kids and experience the miracle of life at the Mon Repos Turtle Encounter. Witness nesting from November – January, and watch as the hatchlings scurry to the ocean from January – March. Explore the majesty of the Southern Great Barrier Reef and swim with the turtles on a day trip with Lady Musgrave Experience, Lady Elliot Island Eco Resort or 1770 Reef. We love our seafood and we do it best. Come enjoy lunch at Grunske's by the River for fresh locally caught seafood, or have an early dinner at Baltimore's Port Marina Café after you hop off the boat from Lady Musgrave Island. Be amazed by the Bundaberg Rum Visitor Experience at the Bundaberg Rum Distillery and learn how this iconic drink is made. Go back in time and explore our historical hotspots. Lean the story of aviation pioneer Bert Hinkler at Hinkler Hall of Aviation, explore the sugar history at Fairymead House Sugar Museum and check out the Bundaberg Railway Museum. The locavore movement is big on the foodie scene and our cafes have not just jumped on the bandwagon but they're driving! Try local-produce-inspired dishes at Indulge Cafe like their 'Pratt's roasted beetroot, Meredith goats cheese, Mundubbera pecan crush, poached eggs and crispy bacon on sourdough toast', or grab some locally-made gelato from Alowishus Delicious, why not try their 'Christmas Pudding' flavour? Spend some time on the water with Bundy Belle and enjoy complimentary tea and coffee while you learn about the history of the Burnett River. Here the stories of our local farmers on a Bundy Food Tour and enjoy morning tea on the farm. Pick up some fresh produce straight from the farmer or stop at a roadside stall on your way home with your new-found appreciation for eating local. A must-do activity for the adventure seeker while in region. Mt Walsh offers panoramic views of the North Burnett and a hike that will get your heart rate up in no time! Get sophisticated at the Bundaberg Regional Art Gallery and Childers Art Gallery, or hit the pavement and explore the street art sprayed around town. Stroll the storybook streets of Childers and stop in at the landmark Paragon Theatre for a Mammino Gourmet Ice-Cream. Mammino's use local produce to create an ice-cream that will have you craving more! Grab a glass and explore Childers' wineries. Try Sicilian-influenced wine at Hill Of Promise Winery, or explore the fruit farm at Ohana Winery and Exotic Fruit farm and try their strawberry wine. Looking for more? Take a guided tour of Childers wine trail with Off the Wagon Tours. Always a good time, the Moncrieff Entertainment Centre can keep you entertained with live performance, plays and movies yearly! Visit Kalki Moon Distilling and Brewing Company and try their award-winning gin and flavour-filled liquors, perfect for a Christmas gift! Don't all cram into one house, enjoy your holiday, give yourself some elbow room and rent out a few rooms on the beach (you know you want to)!